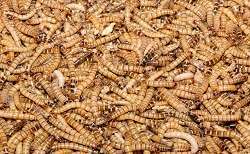 The EU PROTEINSECT project has recommended a comprehensive review of European legislation to allow for insect larvae to be used as a source of protein in animal feed. Europe currently imports 70 % of its protein for animal feed, putting it at risk from ever-growing competition for feed protein from a global population that is set to exceed 9 billion by 2050. Developing nations in particular are seeing a huge increase in demand for animal products, and there has been a five-fold increase in the total consumption of meat since the mid-1940s. The PROTEINSECT project believes that adapting European legislation to allow for the use of insect protein in animal feed will make a substantial contribution in addressing these challenges. To address this growing challenge, PROTEINSECT experts from Europe, China and Africa have been investigating the use of two species of fly larvae in the diets of chickens, pigs and fish, carrying out feeding trials and analysing the quality and safety of rearing farmed flies on organic waste substrates such as manure. Insects are rich in protein and are a natural component of the diet of many fish and free-range poultry. The project argues that fly larvae can be reared on a wide range of wastes and by-products offering a way of recovering value from materials that may traditionally be disposed of by the agricultural and food industries. The biological reprocessing of organic waste was a key concept for PROTEINSECT, as not only would insect use for animal feed help to alleviate Europe's protein deficit, but would also facilitate significant reductions in waste volumes. The project found that fly larvae can reduce the mass of organic waste by up to 60 % in just 10 days, contributing towards the realisation of a truly circular economy. The project's research has also demonstrated that the use of insect protein in animal feed to complement traditional plant sources could contribute to making more agricultural land available for crops to be consumed directly by the human population. This would additionally provide for greater overall food security. Fish, poultry, and pig feeding trials were conducted by the project in 2015 in Belgium and the UK based on PROTEINSECT UK-derived insect protein. These trials evaluated weight gain and growth rates, as well as segment specific factors such as survival rates in Atlantic salmon. Overall, the project observed that there were no significant differences in the animals' performance and even recorded improvements as a result of the insect feed. For example, levels of good micro-organisms (Lactobacilli) were significantly higher in the insect-fed piglets. The project team believes that Europe could become a major global contributor to this alternative and additional source of protein, as well as provide innovative solutions for reducing organic waste. However, they argue that conservative and outdated European legislation concerning the use of insects in feed and food are a major barrier for potential investors, and consequently market entry for insect-derived protein. Specifically, they argue for a review of two EU Regulations that currently prohibit the use of insects as a source of protein for animal feed for animals raised for human consumption, as well as the rearing of insects on manure or catering waste. I would take the black soldier fly to Mars or anywhere else humanity spreads specifically for these reasons. If all else fails, we can eat them ourselves.